On vehicles with a vehicle battery fitted with a colour indicator » Fig. 132, the electrolyte level can be determined by looking at the change in colour. Air bubbles can influence the colour of the indicator. For this reason carefully knock on the indicator before carrying out the check. Black colour - electrolyte level is correct. Colourless or light yellow colour - electrolyte level too low, the battery must be replaced. Vehicles with a START-STOP system are fitted with a battery control unit for checking the energy level for the recurring engine start. We recommend you have the electrolyte level checked by a specialist garage from time to time, especially in the following cases. The vehicle battery only has some of its starting power at low temperatures. A discharged vehicle battery may freeze at temperatures just below 0 °C. We therefore recommend that you have the battery checked and, if necessary, recharged by a specialist garage before the start of the winter. 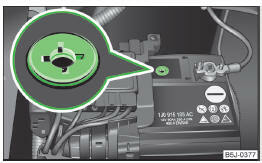 For technical reasons, on vehicles with the description “AGM”, the electrolyte level cannot be checked. The battery electrolyte level is also periodically checked by a specialist garage as part of the Inspection Service.